Our TV Reviews section enters its third week of existence, and here are the shows you can look forward to us reviewing this week! Look for our reviews of shows already in progress (which we know some of you are looking forward to) to begin next week. We’re spreading our reviews throughout the week, to avoid overwhelming you with them on just two days of the week. So here’s what to look forward to! Erik Adams reviews CBS’ new “single guys, living life to its fullest without those stupid ladies around” comedy We Are Men, which debuts Monday night. Todd VanDerWerff takes a look at Rebel Wilson and company in ABC’s latest companion to Modern Family, Super Fun Night. It debuts Wednesday night. NBC has resurrected the old “detective in a wheelchair” show Ironside for no discernible reason. David Sims will let you know if it’s worth checking out. The show debuts Wednesday. 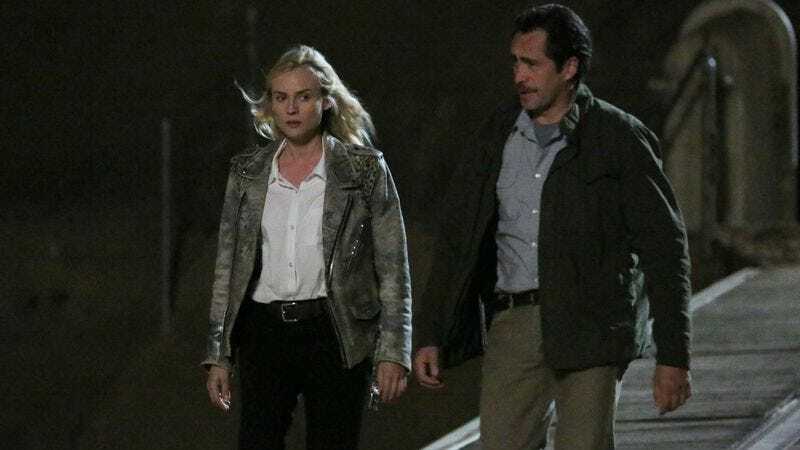 Todd VanDerWerff has seen the entirety of the first season of FX’s The Bridge, and he’ll discuss whether or not it’s worth a look in a review of the full season. The finale runs Wednesday. Carrie Raisler has been covering The Vampire Diaries for us since the middle of season two, so she’s a natural fit to check out the premiere of its spinoff, The Originals. It debuts Thursday, before moving to its normal Tuesday timeslot next week. Todd VanDerWerff covers two Thursday night multi-camera sitcom debuts this day, checking out NBC’s Sean Saves The World and CBS’ The Millers. He kind of grudgingly likes one, while hating the other. Guess which is which! Erik Adams finishes out this day with a look at NBC’s other new family sitcom, Welcome To The Family, which also debuts on Thursday. Did you hear? It’s NBC’s new family night! At 12:30 a.m. Eastern time on Friday on adult swim, the next season of The Eric Andre Show debuts. Brandon Nowalk takes a look at that. Then Friday night, LinkTV presents the English-language debut of the third season of Danish series Borgen. Sonia Saraiya has seen the entirety of that season and will let you know her thoughts. HBO’s made-for-TV movies will fit into this section going forward, and Phil Dyess-Nugent kicks off our coverage of that sector with a look at the Saturday night premiere of Muhammad Ali’s Greatest Fight, from director Stephen Frears. Zack Handlen, meanwhile, takes a look at PBS’ latest attempt to recapture Downton Abbey’s lightning in a bottle with The Paradise, which makes its American debut Sunday night. Finally, Todd VanDerWerff hangs out with some witches, but not the ones on FX, as he checks out the first episode of Lifetime’s new The Witches Of East End, which debuts Sunday. Come back next week, when things will calm down substantially!